North Country Towers, March 6, 2015 from Heather Boa on Vimeo. BRUSSELS – It would be easy to walk past the unremarkable door beside the entrance to the Brussels’ laundromat without a second glance. But the more observant passersby will notice a sign in the transom window above the door that reads: The Upper Deck. And on this Friday evening, groups of one and two and five are passing through the door and climbing the steep steps to a small concert hall to hear North Country Towers, acoustic duo Thomas Beard and Caleb Smith. The low-ceiling hall is arranged with a series of cabaret tables and folding chairs. The front window overlooking the village’s main street is covered with black floor-length curtains. A piano is set at one side of a stage, a series of drums at the other side, proof that the space is a regular venue for musicians. The place is packed with family, friends and music lovers. Many have come to hear Thomas, who is from Wingham. He and Caleb, from North Bay, now attend university in Montreal. 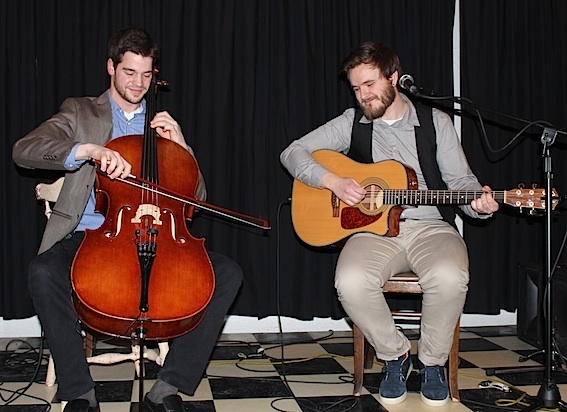 Acoustic duo Thomas Beard and Caleb Smith perform at The Upper Deck in Brussels. Then Thomas settles the cello into his lap and Caleb pulls his guitar into his hip, and something quite magical happens. The guy in the sports coat and scuffed black dress shoes playing an instrument often found in an orchestra and the fellow in the black vest and red socks playing an instrument at home in country bars and rock bands find the perfect pitch. The instruments take their turns in the spotlight, sometimes upbeat and playful, other times slow and mournful. Then Caleb’s strong vocals cut in. You give in and let it consume you. The mostly original playbill speaks of saving princesses and slaying dragons, a bride and groom finding love in their differences, losing binds with the right person at your side, and finding it funny how the smell of dead things and rain can make you feel so great. Their enthusiasm is a pleasure to watch. It’s fresh and invigorating. They laugh at each other at each song’s end, but look like they’d rather give each other a high five. In fact, high fives all round. “They’re so adorable I wanna pinch their cheeks,” said a woman sitting nearby. Before the duo began, the hall’s owner, Jim Lee, took to the stage, holding up an empty fish bowl for the audience to see. “This is how they’re going to get paid tonight,” he said, reminding folks the fish bowl would be set up at the back of the hall when they’re ready to make donations. “ We have a little saying at Cinnamon Jim’s: ‘Keeping live music alive’ and this is what it’s all about,” he said. Live music can be found at venues across Huron County. Check Ontario’s West Coast events calendar for more information. Cheers go out to Caleb Smith & Thomas Beard for a great concert. Wish we could catch more. Saskatchewan would love you guys! It was a most enjoyable evening thanks Allan for including me and my Sister Irene and husband Bernie from Bobcaygeon.